More of this content will be developed soon - but for now here are the basics. First blow molds still had lots of sizes and dimpled knees. T-series heads. This heavy vinyl and blow mold terminology is of my own making - to identify the distinct evolutions in this doll type. I would dearly love to know what Horsman called all of these changes, but so far that remains to be discovered. As noted before, all of this content is based on my own research of scant available resources and careful observation of my own collection. As always, comments, corrections, are welcome. look just like earlier Ruthies and imitate all of their features including the rounded dimpled knees. Arms and legs are much much lighter than heavy vinyl ones. It seems the T series head marks, though sporadically can be found before this body material, they are always a characteristic of the blow-vinyl molds. 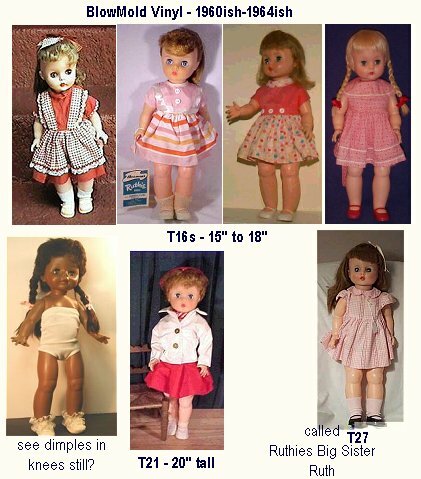 Standard Ruthie head marks for this era dolls: T-14, T-16, T-21, T27 My doll catalogs confirm it, they put the same head on several heights of dolls - they put T-14 heads on dolls 13in, 14in, and 15in tall. They put T-16 heads on dolls 16in, 17in, and 18in tall. T-21 heads are on 20 inch dolls. T-27 heads are on 26-28in dolls which are explained in their separate page - The Large Dolls.. It doesn't make a lot of sense, but those are the facts. A best guesstimates for this time frame is difficult - what is more certain is that all the blow mold types were probably made between 1962 and 1966.